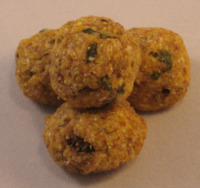 Kidney Bean Morsels Dog Treat Recipe - Your dogs taste buds may not be familiar with kidney beans. But these heart healthy dog treats will make your dog wag her tail in approval. This dog treat recipe is easy for you to make, and beneficial for the health of your dog. Kidney beans are full of healthy fiber, vitamins and minerals that help prevent heart disease. Love your dog and his heart with these healthy dog treats. Have you added fish oil to your dogs diet yet? No? Read our article on the benefits of fish oil for your dog and talk to your Holistic Vet about how to integrate it into your dogs food and treats. 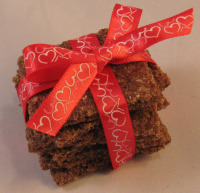 We've featured other heart healthy dog treat recipes in the past. Revisit these favorites, and make one or all of them for your special dog. Cheesy Flax Seed Squares - Flax seed is a heart healthy ingredient. It's loaded with omega-3 fatty acids for the heart, skin, and coat. Your dog may not have a taste for flax seed, but she'll love the cheesy flavor added by the Parmesan. You too may enjoy a nibble of these cheesy squares! 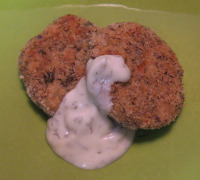 Salmon Cakes for Dogs - A familiar human treat is transformed into a delectable homemade dog treat. Salmon is a very heart healthy ingredient for your dog and you. The salmon is rich in fish oil not to mention the fact that it is just plain yummy! We even devised a healthy yogurt dill dip to make it even more tempting. Tripe Pom Poms - What a wonderful way to show your dog just how much you love her. Baking dog treats with green tripe can be a little smelly. But once you know that it contains taurine, a very heart healthy ingredient, I'm sure you'll want to give this dog treat recipe a try! I can almost guarantee that you have never seen your dog quite as happy as you'll see him after he's tasted these treats. Spinach & Carrot Dog Cookies - Spinach has always been associated with being a nutrient powerhouse. 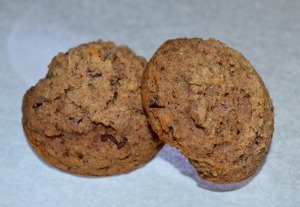 But the added Carrots, Oats and Extra Virgin Olive Oil add their own healthy components to this very heart healthy and tasty cookie. Has all this talk of healthy dog treats made you think of your own way to improve your dogs health? Maybe you could improve the health of dogs all over the country by selling your own homemade dog treats. Check out our review of a helpful guide to starting your own dog bakery business. It's easy to love our dogs. Finding unusual ingredients with which to bake homemade dog treats, can be challenging. Fish Oil - You can put this directly on your dogs food or bake it into homemade dog cookies. Green Tripe - The devotion to our pets knows no bounds. Baking with green tripe is smelly, but worth the effort for your dogs health. Ground Flax - This is becoming easier to find in local markets, but sometimes you can get a great deal by buying in bulk for your dog treats and for an addition to your own healthy meals. Try at least one of the above ingredients for a happier, healthier best friend. Learn even more about Heart Disease in Dogs by visiting this helpful website. Find out about early detection, diagnosis and treating congestive heart failure in dogs. The more you know, the better you can make any changes now for the health of your dog. "I would like to say that your website and ideas are the best I have found on the Internet - really inspiring!" "Thanks again for your great recipes!"